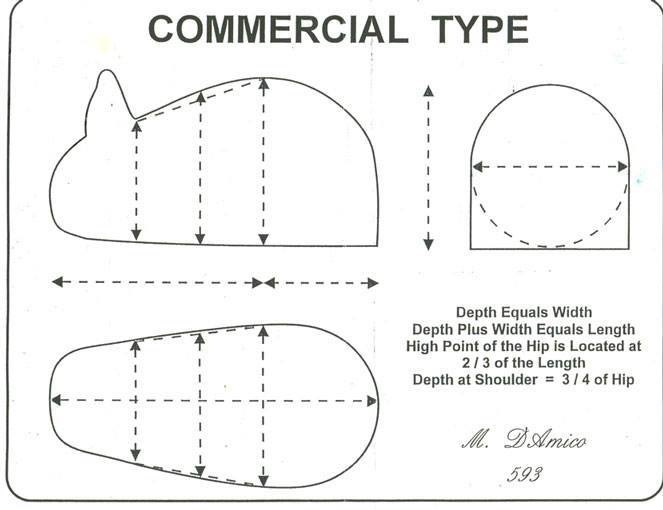 As a new breeder it was very hard for us to understand exactly what people meant when they would say “Commercial Type.” We started out by basically describing it as a basketball with a head! Even as awesome as photos and diagrams are, sometimes it’s helpful to actually see something, so I took a few (very amateur!) videos of our rabbits and what we look for when posing and evaluating them. The disclaimer is that we are not rabbit judges and we are not the be all end all of rabbit breeders – but we are pretty good listeners and active learners from those who will teach! Here is a dialogue of a few of the things we have learned and try to implement in our rabbitry. If these videos can be helpful, we’re happy to share! This is Triton. He’s a Grand Champion Silver Fox with six championship legs to date and has won Reserve in Show. This is Dawn. She is a blue silver fox, which cannot win any awards as it’s not a recognized color yet, but you can see that we like her depth and don’t prefer her fur. There’s no perfect rabbit! This is Lucy. She is a Grand Champion Cinnamon with six championship legs to date. She was kind enough to show you the difference between an unposed rabbit and a posed rabbit. Here are a pair of two 10 week old Silver Fox kits. Good tutorial, thanks for your time. I’m so glad! There are some things that video really helps more than descriptions, huh?! Is there any chance you could fix up the other videos so that they’re viewable again? Thanks & I look forward to exploring around your site some more! !